One of the fun things I'm doing this year is serving as a brand ambassador for Lunchbox Love's Mom Panel! What does this mean? I get to help spread the word about a great company, which just so happens to fit in really well with the whole lunch theme of my blog. Even more fun, to kick it all off, they offered up a giveaway for What's for Lunch at Our House readers! So, what is Lunchbox Love? It's a great company, founded by two moms, who know the power of happy thoughts to a kid. 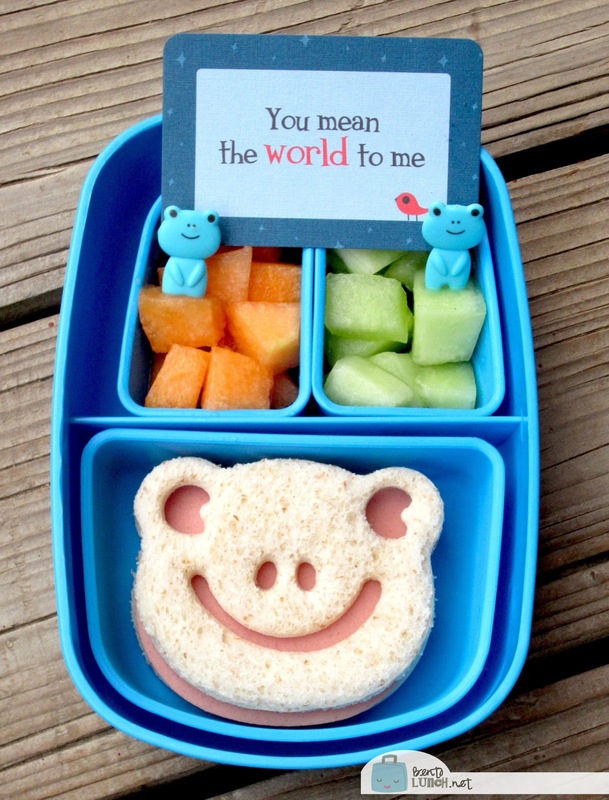 Each Lunchbox Love note contains a happy, supportive thought on one side, and a joke or a fact on the other, perfect for tucking into a lunchbox. I also love that they are already thought out, as 7am is not when I'm at my most creative. Or cognizant. Or even fully awake. I'm giving away a 4 pack of Lunchbox Love notes this week! Want to win? Use the Rafflecopter below and leave a comment telling me who you'd love to send a Lunchbox Love note with! For more entries, tweet and/or follow me on Facebook! As a member of the Lunchbox Love Moms Panel, I have received compensation for this post, as well as sets of Lunchbox Love notes to help facilitate the review. All opinions expressed are my own. I'd send one to school with Scout, and I'd tuck one into my Mom's airplane bento when I'm forced to send her back home after her annual visit out west. I will have 3 little ones getting Bentos this year, and we have just moved to Colorado from Mississippi. I love sending them lunch notes to lift their mood midday, but I think it will mean even more this year with their new environment. I would use them for my nieces and nephews lunches. These would be perfect to share with our nieces and nephews who are learning English! I'll have two kids in school come September, so I'd send the notes in their lunches! I'd give them to my two boys. My two kiddos, 7 and 9 years old. I have been packing their lunches for years. I would sent my in my daughter's lunch. She is 10. My 2 girls with their lunches! I would love to be able to include these notes in my daughters lunch each day. I have looked at buying them several times but haven't yet. Definitely my son, who is (or was) a picky eater, and is loving the Bento Lunches. I sometimes pack a small snack in his bag when he spends a weekend at his Dad's, these sweet little cards would really bring a smile then too. I'd give them to my ,an who works two jobs. My son, who is starting Kindergarten this year. He will have packed lunches due to a diagnoses of Celiac Disease and Type 1 Diabetes earlier this year. I think those pick me ups would cheer him. I leave little handwrittens, but these are just so cute! My beautiful 2nd grade daughter needs these in her lunch box :) And of course, my awesome little boy when he's able to read! So cute! My boys are going into K and 3rd grade at a new school this year and I know these little notes will be a great pick-me-up. Thanks for hosting! How cute. My twins who are going into first grade this year would love these!! I like to pack my son bento lunches, but we run into trouble because the individual containers in his boxes are not sealable. He likes sliced tomatoes, but when I put them in a container, tomato juice will leak out into his other containers. Any advice? Thanks. I'd send lunchbox love to my kiddo and hubby! I aways think about sending notes but end up just writing "I love you" on a napkin! This would be much cuter for my two girls! I'd leave notes to my husband because my son can't read yet! He'd get them in a couple of years. I love hiding Lunchbox Love Notes for my husband to find!! My three still love getting notes written on their napkins! This would be a surprise bonus. Would love them! My first grader is going to love them! I couldn't wait and already ordered some!! well, there is the obvious...my kids and hubby. But I also bring meals to my uncle in a nursing home...I think something like that would brighten his day. Short and simple. I would love to send these for my girls in their lunches!! I would love to send Lunchbox Love notes with my third grade daughter, who eats lunch at school, and my preschool-age son, who eats lunch at Grandma's while I'm at work! Love these, great idea! I'd love to pack them for my 3rd grader and Kindergartner! Would love to stick some lunchbox love into my Little Bee's 1st grade lunches. Thanks for the giveaway opportunity! I'd put them in my son's lunchbox. Lots of times when I send a note with him I'll find it later stashed in his room or in a book. So sweet! I would love these for both my son and daughter! I would send them with my 2nd grader and maybe sometimes put one on his pillow. My son would love these! I hope that stage doesn't end to quickly! I'll send them to my sister for sure! I have 3 kids taking lunches this year! Yikes! I will pack them in my kiddos lunch to make it a little more special!